AAnderaa has partnered with a World Class VTS (Vessel Traffic System)-vendor and installed a system as shown in attached presentation. The sensors and data collecting platforms are a totally proven AADI solution. The buoy system, the tide system and the weather station reports data in real-time (10 minute interval) through the communication link to the receiving computer. Data carrier is here VHF/UHF radio telemetry. The transmitting range is up to 15km depending on the ground conditions. Incoming data is interfaced and distributed to the VTS system. 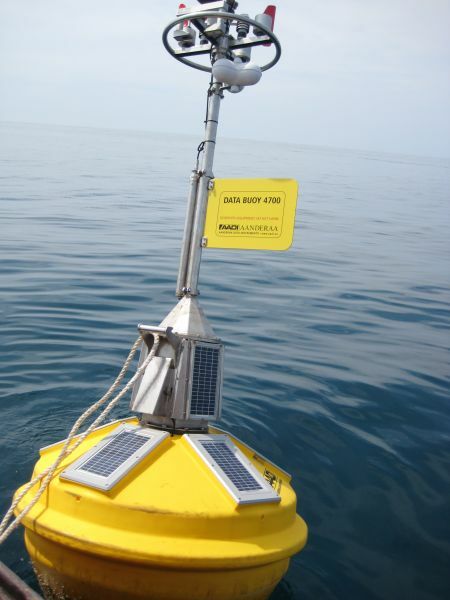 The solar panels on the surface buoy provide energy for the sensors on the buoy, as well as the communication link. On the surface buoy there are also radar reflector and flashing light to identify the buoy. Aanderaa have made installations in ports, harbours and sailing fairways all over the world from arctic to tropical climates. This is just one example. If you are intrested in our marine transport harbour monitoring systems please contact us at aadi.info@xyleminc.com or tel: +47 55 60 48 00.